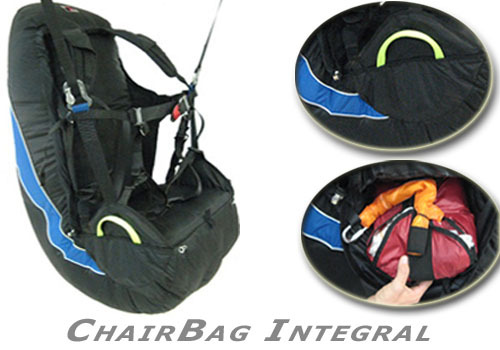 The ChairBag is a new convertible harness/backpack by APCO. Sophisticated, super-light dual-purpose harness - a harness when flying and a backpack when traveling, all under 2.5kg. Designed for pilots on the go who want the comfort and safety of a full feature harness for half the weight. 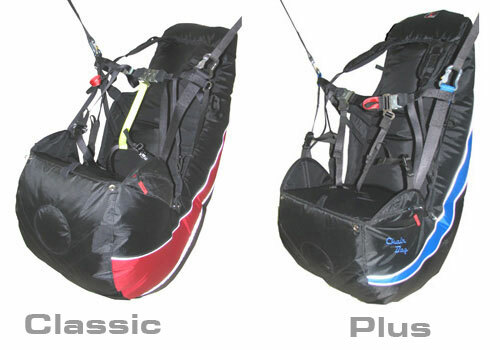 Just flip the harness inside out, throw in your glider and you are ready to go. Professional carrying system with gel padded shoulder straps and waist belt insure comfortable, effortless hikes to take-off. Unlike other convertible harnesses on the market, the ChairBag comes with a full-size seat plate for maximum comfort and weight shift control. Maximum pilot protection insured byintegrated Cygnus air bag system with specially designed one-way air valve. Fitted with quick lock buckles throughout and Aluminum loop-and-slide adjusters for easy in-flight use, the ChairBag provides lavish comfort where you least expect it.